Ernst Kaltenbrunner was born in Austria, approximately 30 miles from the birthplace of Adolf Hitler. Too young to see service during World War I, Kaltenbrunner had a quiet upbringing and attended school with another future SS officer, Adolf Eichmann. He graduated as a lawyer in 1926, then joined the Nazi Party in 1930 and the Austrian Schutzstaffel (SS) the following year. Kaltenbrunner rose through the ranks of the Austrian Nazi Party, serving as a regional organiser and legal officer. In 1934 he was implicated in the assassination of the Austrian chancellor, Dolfuss, and spent several months in prison. On his release, Kaltenbrunner became the leader of the Austrian SS and served as a link between Berlin and the Austrian Nazi movement. Kaltenbrunner was an important figure in the successful 1938 Anschluss; as a reward, Hitler engineered his selection as a member of the German Reichstag. From 1939, Kaltenbrunner was given responsibility for security in his home country. His ability to create and maintain intelligence networks in Austria impressed Himmler, who recommended him for more significant duties. 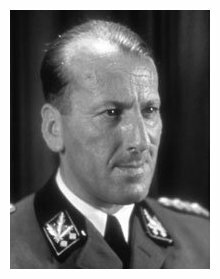 After the 1942 assassination of Reinhard Heydrich, Kaltenbrunner was put in command of all Nazi security forces, including the Gestapo, the Kripo and the Sicherheitsdienst (SD). These responsibilities put him directly in charge of concentration camps and other structures responsible for carrying out Hitler’s Final Solution. In the final days of the war, Kaltenbrunner received the meaningless honour of commanding all German forces in southern Europe. He was arrested in May 1945 and charged with war crimes at Nuremberg. Despite pleading not guilty, Kaltenbrunner was executed in October 1946. 1. Ernst Kaltenbrunner was an Austrian lawyer, born just a few miles from Hitler’s own hometown. 2. He joined the Austrian wing of the NSDAP comparatively late but soon became a party organiser and influential local leader. 3. In 1934 he was implicated in an assassination and imprisoned, before returning as leader of the Austrian SS. 4. Kaltenbrunner was an important figure in the Anschluss of 1938, after which he became a Reichstag deputy and SS chief of security in Austria. 5. After Heydrich’s assassination in 1942, Kaltenbrunner assumed command of the Gestapo and other Nazi security divisions across occupied Europe. J. Llewellyn et al, “Ernst Kaltenbrunner”, Alpha History, accessed [today’s date], https://alphahistory.com/nazigermany/ernst-kaltenbrunner/.